The Barnacle Goose remained in the obs field at Long Nab. A large movement of auks (mostly Razorbills) north totalled 4802, also past there were two Pomarine, six Arctic and two Great Skuas, a Sooty Shearwater, single Sandwich and Common Terns. Flying in from the east were a flock of seven Snipe, a Kestrel, Grey Heron and a single Starling. Wildfowl included a Pintail at Potter Brompton Carr, 25 Wigeon at Scalby Mills and 120 Teal at Wykeham South Lake. 13 Ringed Plovers were feeding in Jackson’s Bay. 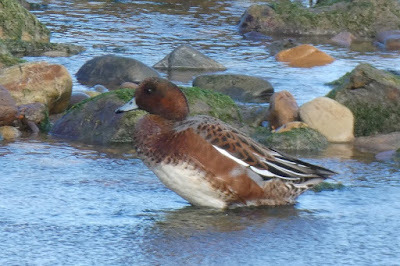 The Eider remains at Scalby Mills, also a Kingfisher there.